As promised a while back on the Penneys To Prada Facebook page, it's time for a Penneys/Primark haul. Summer is so close I can almost taste it, so naturally I've been buying far too many summery clothes over the past few weeks. I'm actually spending most of the Summer in America (something I am very very excited about) and so I've been picking up clothes that I can wear in very warm weather. Penneys/Primark always have everything you need for the Summer months at extremely reasonable prices so it's always the first place I go as soon as the weather starts to warm up. First up is bikinis, where I'm headed to in the States is right on the beach so I'll be spending a lot of time in a bikini. I like to mix and match my bikinis and Penneys give you the option of buying most of their bikini tops and bottoms separately. The gorgeous lace detailed turquoise bikini top was €7, the pink halter neck top was just €4, the tie dye bottoms were also €4 and the black bikini set was €8. Onto shorts, something I have far too many of, although I did actually need a new pair of black denim shorts (€7) as my pair from last year are now too big. The other two pairs of shorts were just €4 each and I love the patterns on them! Penneys always have amazing Summer footwear and while they may not be the best quality, you're only going to be wearing them for a couple of months anyway. I always pick up a new pair or two of flip flops every year. The twin pack were €2.50, the black bamboo effect pair were €3 and the Birkenstock lookalikes were just €5! A little tip with Penneys' flip flops is to go a size up in them as their sizes can run quite small. This next item might be a bit random but if you've never used these clothes hangers you are seriously missing out! They're velvet covered and slim, so your silky dresses/shirts won't slide off and you can fit more into your wardrobe, genius! Dresses are one of my favourite things to wear in the Summer, they're so easy and comfortable to wear. 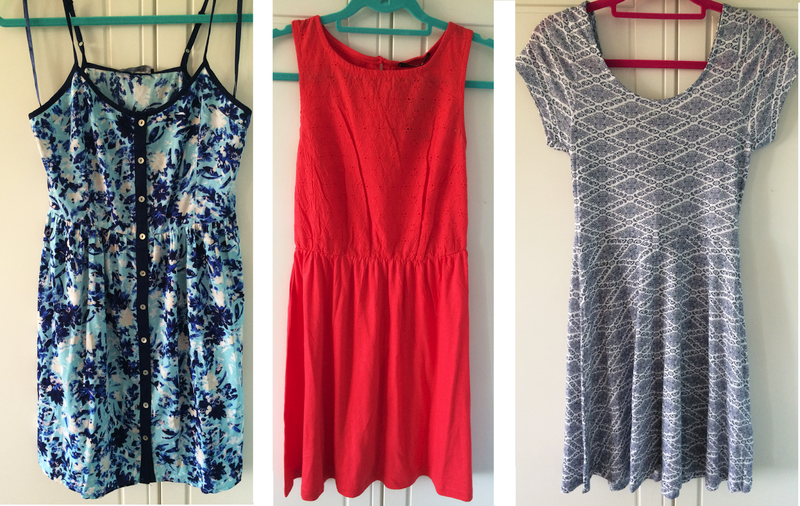 The dress on the left was €6 and is really light, the dress in the middle was €7 and has a lovely eyelet detail and the dress on the right is the perfect t-shirt dress for just €6. Next up is jewellery, specifically necklaces. On an everyday basis I usually just wear the gold necklace my boyfriend gave me for my birthday but every now and again I like to layer it with a few other necklaces. 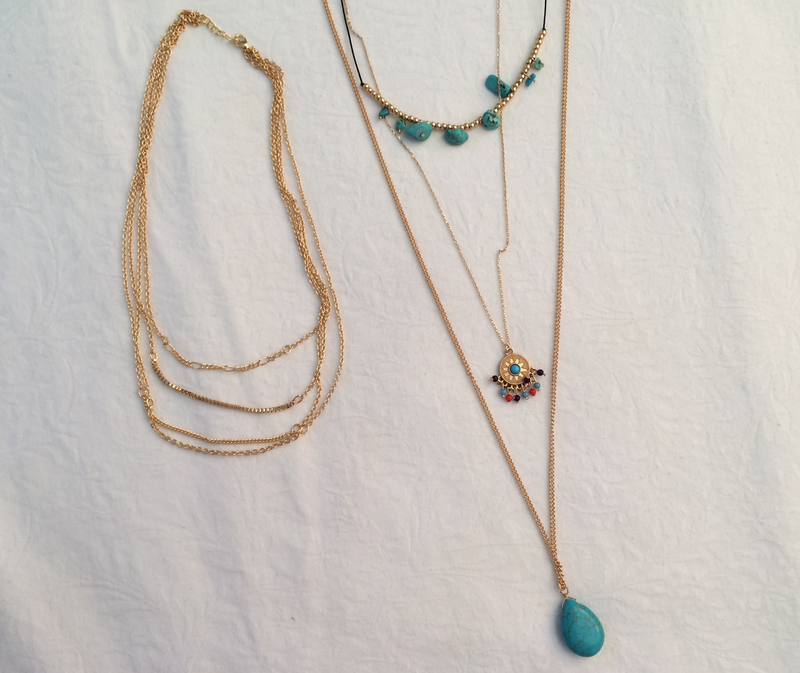 The four chain necklace on the left was €4 and goes perfectly with my everyday one and the long three chain pendant necklace was €5. 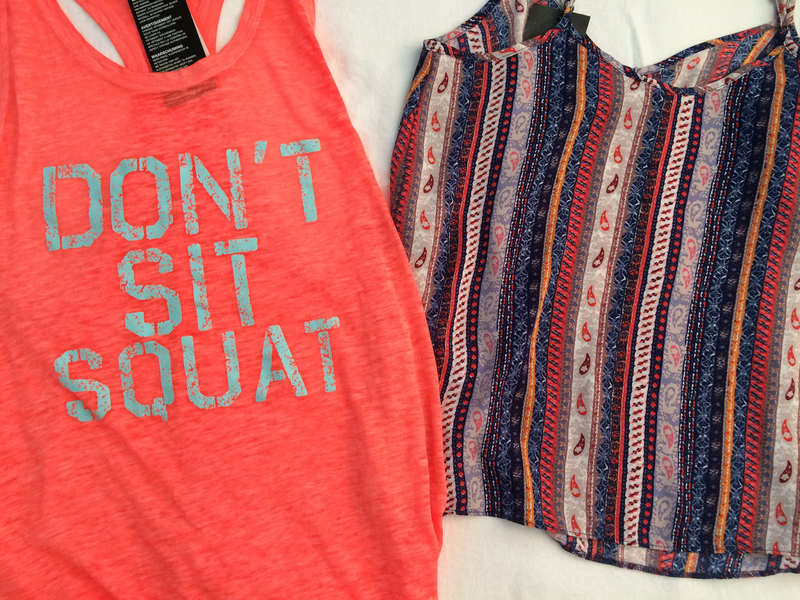 When I saw this workout top that says 'Don't Sit, Squat' I had to have it! It was €6 but be warned, it is very oversized and long. The floaty top on the right was love at first sight for me, I'm obsessed with the print and for just €5 it was a bargain! Finally we have all the miscellaneous bits and pieces. I'm going to hold my hands up right now and say that I have an addiction to buying sunglasses, I must own over 20 pairs by now. In my defence, the black rainbow mirrored pair were only €1.50 from the mens section and the tortoise shell pair were €2.50. These cosmetic pads are my favourite thing to use for removing my makeup with my cleansing water and for €2 you definitely get your money's worth. I picked up some nail goodies too, I'd been on the lookout for the perfect baby pink nail polish and this one from NYC was exactly what I was looking for. I then spotted two things I hadn't seen before in Penneys, a gel effect nail polish €2 and a nail polish fast dry spray €1, once I've given these a good testing I'll do a review! The last and final thing in this rather large haul is a copy of the Travalo perfume atomizer spray bottle (€2), this is such a handy thing to carry in your handbag or even bring with you on holiday. I hope you enjoyed this post, thanks so much for reading!